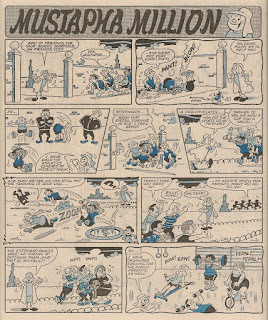 Whizzer and Chips dated 28 June 1986 is the source of this Mustapha Million tale in which the philanthropic funster causes a certain amount of athletic antagonism before resolving the train of events to the satisfaction of all. But who is the errant Whizz-kid intent on derailing the fun? Scroll down for the answer. Yes, it's the mono-molared* confectionery consumer Sweet Tooth, carrying out his first raid on one of our ex-Cheeky Weekly chums. This is the eighth raid perpetrated upon the middle-eastern moneybags, and the twentieth incursion by those pesky Whizz-kids into the pages of Cheeky Weekly survivors, who themselves had by this stage infiltrated Whizzer on 10 occasions. *Okay, I know that Sweet Tooth's surviving gnasher is in fact an incisor but that didn't serve my alliterative purposes. I've ran out of steam...no train gags left to use..all the jokes I had have been used by you and gone up in smoke..
Don't go off the rails!